The Tamaskan Dog is a crossbred dog of sleddog type, created in Finland, and as of 27 November 2013, has been recognized by the American Rare Breed Association, and the Kennel Club of the United States of America, two related dog fancier and pedigree registries. It is a highly versatile dog that can excel in agility, obedience and working trials. Morphologically, Tamaskans have been bred to look like wolves and wolfdog-hybrids and have a notable lupine appearance. Although there are a little over 600 registered Tamaskan Dogs worldwide, increasing interest has resulted in their spread throughout continental Europe, the UK and the USA, as well as Canada and Australia. Tamaskans are large, athletic dogs; slightly taller in size than German Shepherds. With regard to build, they are substantially larger than typical sled dogs but smaller than the Alaskan Malamute. They generally resemble grey wolves and wolfdogs. 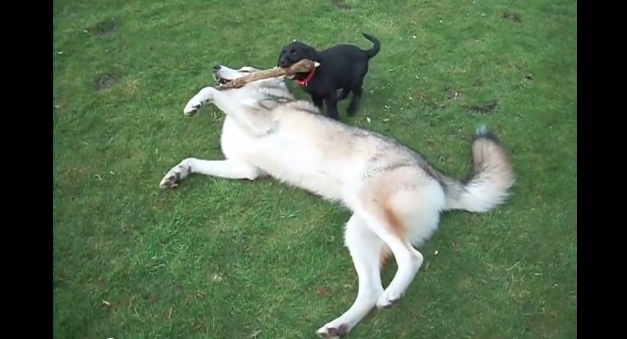 Responses to "Tamaskan and Labrador puppies sharing a stick (Video)"